The imposition of sanctions by the U.S. against terrorists, terrorist organizations, and their support structures is a powerful tool in the detection and prevention of terrorism. At the State Department, this takes the form of two types of ‘designations’ on so-called “do not touch lists”, which it can use to deny individual terrorists and terrorist organizations access to the U.S. financial system; these include:Specially Designated Global Terrorists (SDGTs) and Foreign Terrorist Organizations (FTOs). In a recent webinar at SanctionsAlert.com,Jason Blazakis, Director at the Office of Counter terrorism Finance and Designations at the U.S. Department of State – Bureau of Counter terrorism, discussed the role that the State Department plays in designating terrorists as well as the process employed by the State Department to make a terrorist designation. Mr. Blazakis launched his talk with an audience poll, which asked: “FTOs are designated by the Secretary of State in accordance with which law?” – The audience had a choice of three answers. Only 15% chose the correct answer. In fact, the State Department’s power to apply FTO and SDGT designations to individuals and organizations derives from different sources. While the former derives from Section 219 of the Immigration and Nationality Act (INA), the latter derives from Executive Order 13224 pursuant to International Emergencies Economic Powers Act (IEEPA). In addition to their varying derivations, FTOs and SDGTs carry different consequences. All funds under the control of a U.S. institution are frozen. Aliens are inadmissible to, and may be deportable from, the U.S. Illegal for persons subject to the jurisdiction of the U.S. to knowingly provide material support to the organization. Violators subject to civil and criminal penalties of up to 15 years imprisonment and fines. Provides the Department of Justice an important prosecutorial tool. Property and transactions under U.S. jurisdiction are frozen. Illegal to engage in transactions with designated individuals or entities. Criminal penalties of up to 10 years imprisonment and fines. Provides the Department of the Treasury the ability to make derivative designations of individuals and entities providing support to a designated individual or entity. Most importantly, notes Blazakis,the FTO designation gives the Department of Justice (DOJ) a powerful tool to prosecute individuals, whether in the U.S. or abroad, who provide “material support”– a broad term contained in 18 U.S. Code 2339A, a 1996 federal terrorist law – to an FTO. According to Blazakis, “More than 50% of all counter terrorism prosecutions in the U.S. track back to some kind of link between an individual who is trying to provide material support and an FTO”. The SDGT designation is more important to the U.S. Treasury Department as it allows them to make ‘derivative designations’ based on an individual’s SDGT status.Many times, the Treasury Department cannot make designations unless an individual/organization is first designated by the State Department. Both FTOs and SDGTs are placed on OFAC’s “Specially Designated Nationals” (SDN) list. The SDN list is a compilation of persons and entities that are blocked or designated under a variety of sanctions programs. FTOs and SDGTs are identified on the SDN list with program code or tag “FTO” or “SDGT”. 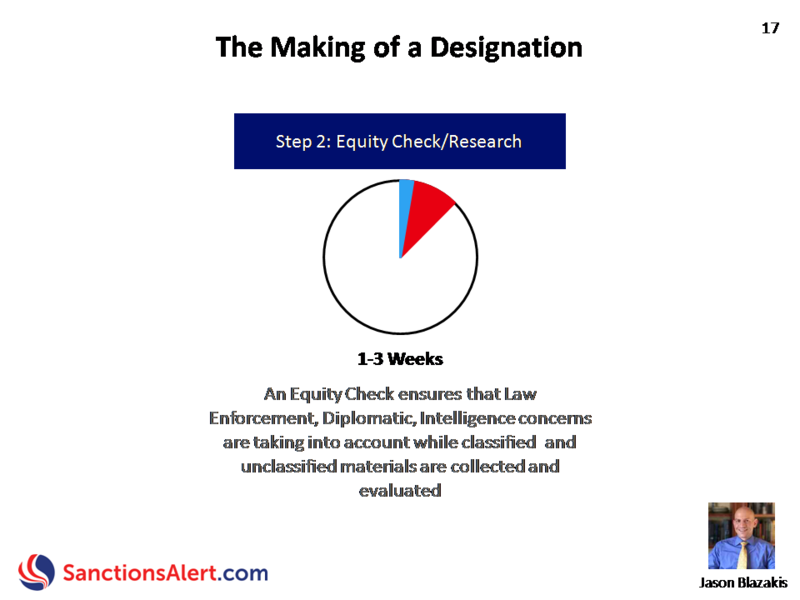 Mr. Blazakis goes on to identify the key steps in the process of making a designation by the State Department, which can take anywhere between 3-6 months to complete. Firstly, the State Department must Identify a Target. Mr Blazakis explains that this involves identifying a potential individual or organization. In order to do this, the State Department will make their own determinations and also consider recommendations from other U.S. agencies, such as the Treasury Department.This usually takes only 1 week. 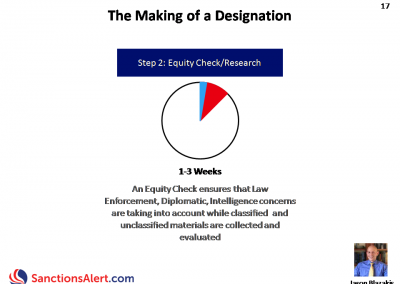 Once a target is identified, the State Department must conduct an Equity Check/Research. This involves drafting a few paragraphs outlining the individual or groups activities to identify if there are any sensitivities or overlap with other agencies. Often times, this is where a designation fails in furtherance of other, more important, overarching objectives. This step can take 1-3 weeks. If the target survives the Equity Check, the State Department moves on to drafting an Administrative Record. 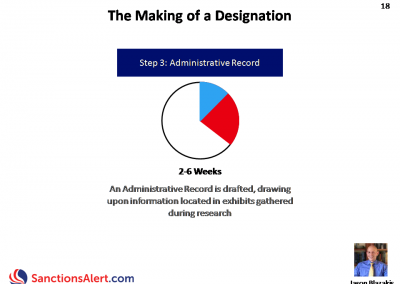 Similarly drafted to a dissertation or thesis, the Administrative Record is a legal document that will form the fundamental background for the designation and is comprised of public information such as: news articles and Facebook posts, as well as classified information, such as: human intelligence reporting. This ‘draft package’ usually takes between 2-6 weeks to be put together. 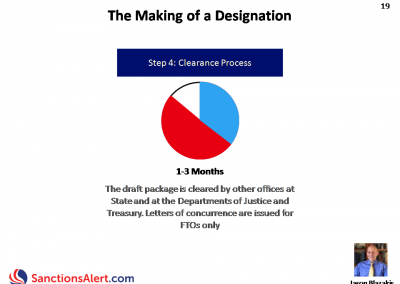 Once the Administrative Record is created, the draft package is put through a highly bureaucratic Clearance Process. During this time, the Administrative Record must be reviewed by the DOJ and the Treasury, as well as their own legal team in order to make sure that the decision to move forward is backed up by solid evidence. 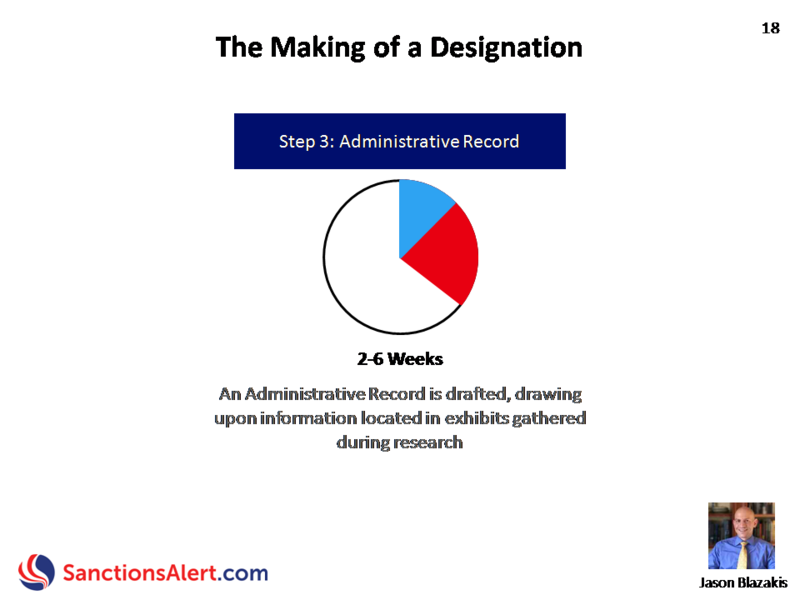 This is the lengthiest part of the designation process and can sometimes take up to 3 months. Once the Administrative Record is approved by all agencies, the package is sent to the Secretary of State for a Decision. It will be up to the Secretary of State whether or not to approve the designation. This step usually takes less than two weeks. 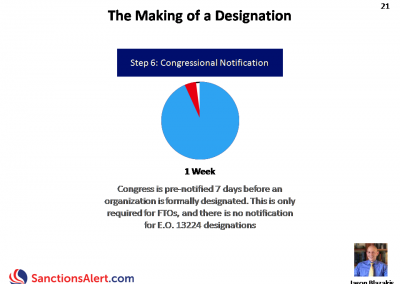 If the designation is an FTO, Congressional Notification takes place. 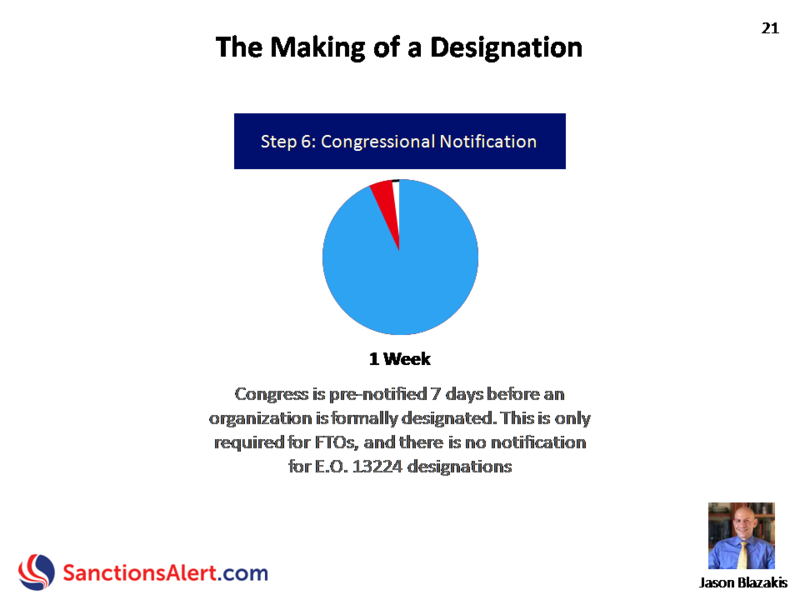 Congress is pre-notified 7 days before an individual or organization is formally designated. This notice is not required for SDGTs. 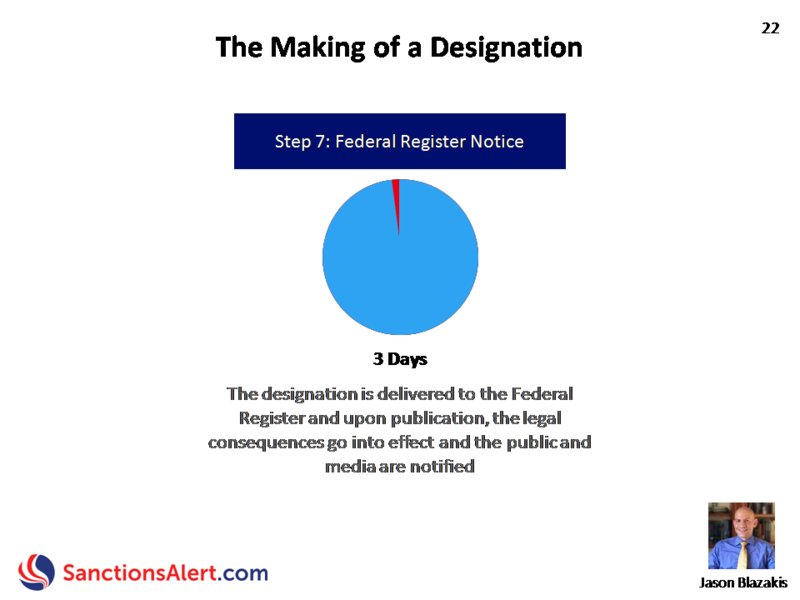 Lastly, the designation is published as a Federal Register Notice. At this point, the legal effects of the designation go into effect and the State Department will announce the designation through a press release. Often times, the delisting process is simply a reverse version of the designation process.There are, however, a few key differences between reversing an FTO as opposed to an SDGT. When an FTO is challenged, it must be heard at the Federal Court of Appeal in the first instance, whereas a challenge to an SDGT can be brought at the District Level (i.e. one level lower). An FTO challenge must also be lodged within 30 days of the designation. After that time, it will be reviewed every 5 years, at which time the State Department will review whether the basis for designation has changed. 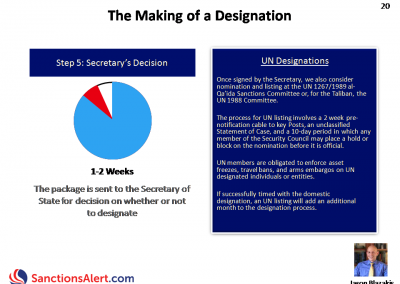 If circumstances have in fact changed, it is mandatory for the State Department to delist the designation. The role of the State Department in sanctioning terrorists is not well known, but should not be overlooked. 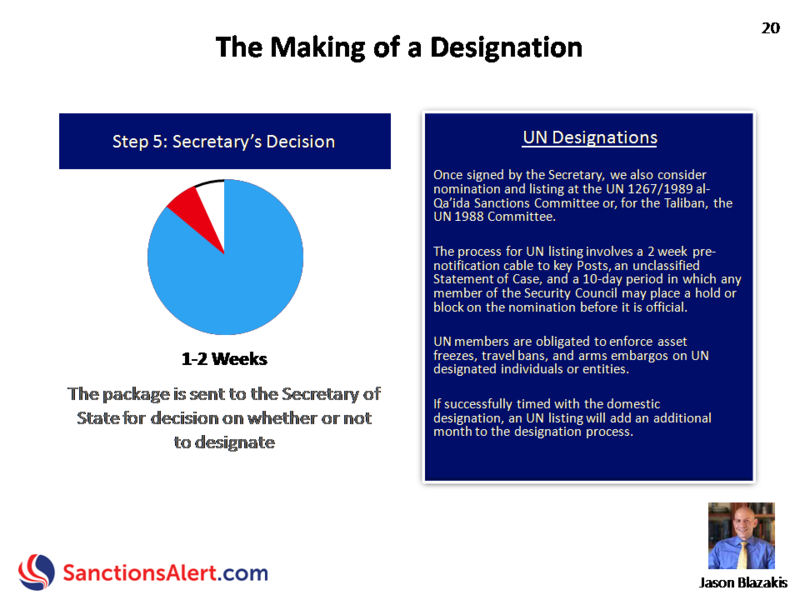 Just like U.S. Treasury’s designations, U.S. State Department designations have broad consequences. “A terrorist designation doesn’t just result in blocked assets and assets freeze. It does other things as well,” says Mr Blazakis.“An FTO designation provides the DOJ tools in the context of its prosecutions of individuals who may be engaged in “material support”and it provides leverage for DHS to declare individuals inadmissible to the U.S., if necessary,” he explains. The next Sanctions Alert webinar, “Practical Considerations When Doing Due Diligence on Iranian Business Partners and Counterparts”will take place on December 14, 2017.